Glazes are not as inert and stable as many people think. All are slightly soluble and will thus leach to some extent, even if minute, into liquids they come into contact with. However some glazes are dramatically more soluble than others. It is common for leaching glazes to suffer from more than one risk factor. 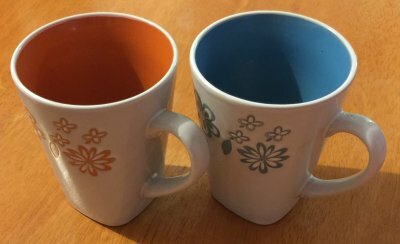 It is also common to find leaching glazes in use by practitioners, even professors, ones who have cultivated a deliberate lack of awareness on this subject (people like these make it harder for the rest of us to market functional ware to increasingly wary customers). The subject of leaching and glaze safety often involves glaze chemistry (more about that below). But it is also alot about common sense. Obviously, there is more concern if the glaze will be exposed to a hot acidic or caustic liquid for lengthy periods than if the vessel will simply be used for serve cold food. Or if it is not melted well. Of if it contains a high percentage of a heavy metal colorant. Simple tests and logic apply here (see links on this page). At first it might seem logical to send your glazes for testing at a lab. However is this really necessary? Suppose you are using a liner glaze (without colorants) and that contains no materials that could release barium, lead or lithium (obviously you need the recipe to know this). And, suppose it is melting well, not crazing and wears well. Why have it tested for leaching? There is an implication here: Start using a liner glaze whose recipe you know to contain nothing dangerous and stop worrying. What if you are using a commercial transparent or white liner glaze, one with an unknown recipe? The changes are very good it too is safe. And expensive. But what if it is a commercial brightly colored glaze? They bottle says it is safe, but you know it contains heavy metal colors. How confident can you be it is really safe? Do the simple leaching tests mentioned on this page. However, notwithstanding that, should one really be using a brightly colored glaze on a good surface? Why not just send it to a lab? But they are going to want to know what elements to test it for. How will you know? They are not going to tell you if the glaze is safe, they are just going to generate a report full of numbers. Maybe the small number for one leaching element actually indicates more danger than a big number for another. What will you really do with those numbers? 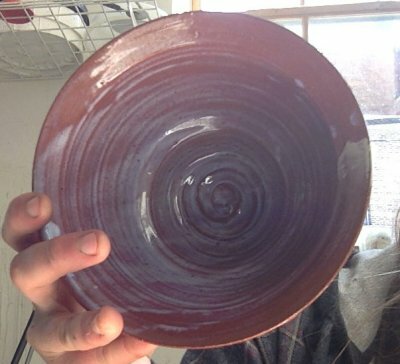 What if you really need to use a colored glaze on a food surface and want to use one you make and know the recipe for? There are simple, practical tests referred to on this page to check for leaching. In this case you could send it to a lab because you would know what elements to have them test for. But, you would still be faced with trying to make sense of the numbers on the report. 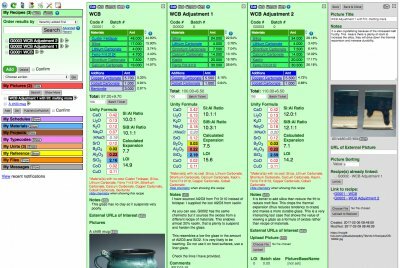 Glaze chemistry enables you to look at a glaze as a collection of oxides rather than just a recipe of materials (Insight-live, for example, automatically calculates the oxide formula of glaze recipes you enter and change). Fired glazes are what they are because of the chemistry more than anything else. Imbalances in the oxide formula can help explain a tendency to leach. Likewise a balanced oxide formula will suggest stability and likely resistance to leaching. The term 'balance' often simply refers to a glaze having oxide quantities in keeping with typical target (or limit) formulas for the temperature range. Limit formulas are about what mixes of oxides melt well and form a good glass (not whether they are food safe). That being said, if a glaze melts well and forms a good glass it is less likely to be leachable. As noted, glaze bases can be inherently safe simply because they are made from nothing but non-hazardous materials (so it does not matter if they leach or not). But if heavy metal colorants are incorporated into the recipe these could be leached out of that glaze. Glaze bases can be inherently leachable (most often because of inadequate SiO2 or Al2O3 in combination with the presence of obviously toxic compounds like lead, barium, cobalt, chrome, etc.). 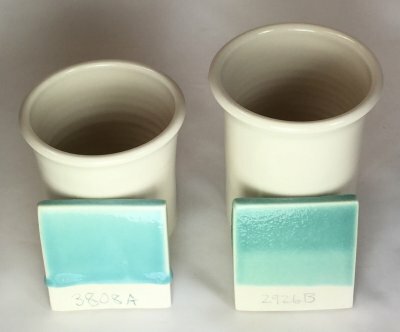 Or stable glaze bases can be made unstable by additions of excessive percentages of colorant or conditioner, or by improper firing (e.g. not fired hot enough, over fired to the point of extreme melt fluidity). 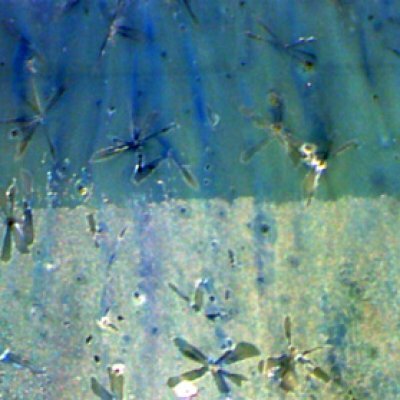 Likewise, glazes that might appear to be likely candidates for leaching because they contain significant lead or barium may, in fact, have very low leaching because of a carefully engineered oxide balance. 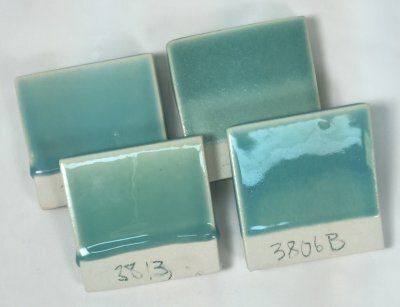 Another factor is speed of kiln cooling: Certain glazes crystallize if cooled slowly (especially if a colorant is super-saturated in the melt), those crystals can be leachable. The best prevention for leaching is simple leach testing (with acids and bases), enough awareness of chemistry and materials to know what to try to change to improve the situation and a willingness to do the testing and adjustment. A closeup of a glossy Cone 6 glaze having 4% added copper carbonate. The bottom section has leached in lemon juice after 24 hours. This photo has been adjusted to spread the color gamut to highlight the difference. The leached section is now matte. 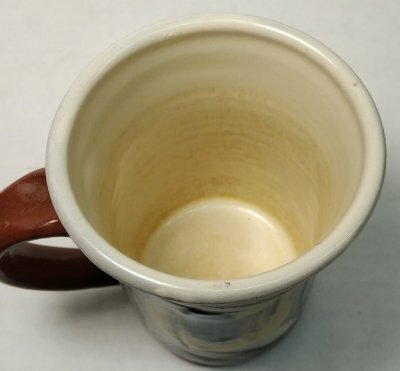 Glaze is coffee-staining and leaching after two years. Is it toxic? This is a cone 04 terra cotta piece. The coffee stain cannot be removed because the coffee has also leached off the surface gloss. Glazes are glass. Glass is leachable if the chemistry is out-of-balance. So is this glaze poisoning the user? No, it has an insurance policy. It is transparent, it is made from a mix of two frits (Ferro 3124, 3134) plus kaolin and silica. The recipe contains no heavy metal colorants or pigments and no toxic fluxes like lithium or barium. But the body is red, how can the glaze be white? A white porcelain-like engobe was applied at the leather hard stage and it was clear-glazed after bisque. The fix: The predominant frit, 3134, has almost no Al2O3. So I increased it (doing the chemistry in my Insight-live.com account) and began firing at cone 03. 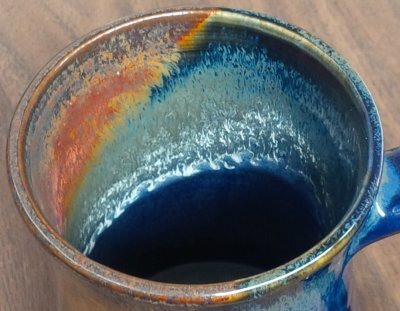 Does copper cause glazes to leach? These are four cone 6 glazes of diverse chemistry. They have varying melt fluidities. They are soaked (half way up) in lemon juice over night. None show any evidence of surface changes. All contain 2% copper carbonate. If the copper was increased, especially to the point of going metallic or crystallizing, likely the leaching test would have different results. 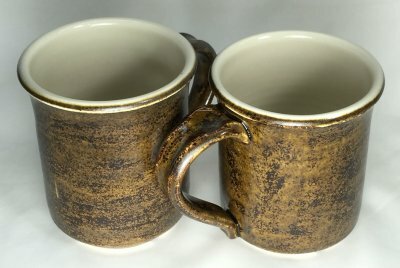 So, if you use copper sensibly (in moderate amounts), there is a good chance you can make a glaze that resists leaching. Encapsulated stains can reach their limits in a glaze host at cone six and begin to dissolve and decompose. That is an obvious problem on a food surface. But in a less fluid underglaze they can survive longer. The bright orange color on the left was likely done this way. The transparent over glaze is isolating it from any contact with food or drink. However people are more wary of the risk of glazes leaching heavy metals and having bright colours on food surfaces may not send the right message. An extreme extremely runny glaze at cone 6. Is there a cost? This recipe melts to such a fluid glass because of its high sodium and lithium content coupled with low silica levels. 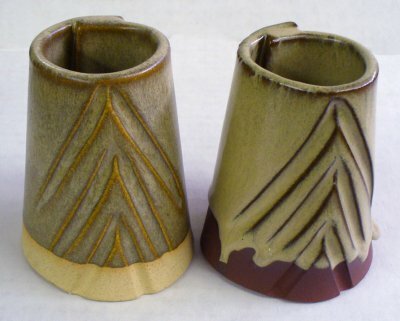 Reactive glazes like this produce interesting visuals but these come at a cost that is more than just the difficulty in firing. 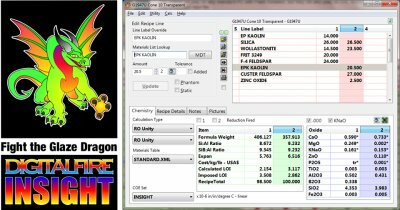 Recipes like this often calculate to an extremely high thermal expansion. That means that not only will this form a lake in the bottom of ware when used on the inside, but the food surfaces will craze badly. The low silica will also contribute to leaching of the lithium and any colorants present. 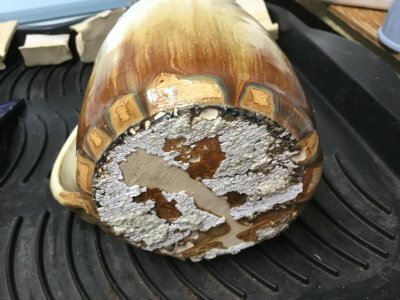 (Articles) Are Your Glazes Food Safe or are They Leachable? Many potters do not think about leaching, but times are changing. What is the chemistry of stability? There are simple ways to check for leaching, and fix crazing. Max Richens outlines the various mechanisms by which acids and bases can dissolve glass and glazes. He provides some information on stabilizing glazes against attack. (Articles) Are You in Control of Your Production Process? Potters often run operations that are on the edge of control and they tolerate production and ware problems that industry would not. However ethics an honesty with yourself will soon or later demand a better knowledge of process and materials.